The University of Tennessee Health Science Center's (UTHSC) Junling Wang, PhD, professor in the Department of Clinical Pharmacy and Translational Science, has been awarded over $1.4 million from the National Institutes of Health (NIH) to further her research on the equity and economic effects of medication management therapy programs. Drug-related morbidity and mortality cost the United States over $177.4 billion annually and these figures are especially concerning among the elderly. The Department of Health and Human Services' Centers for Medicare and Medicaid Services (CMS) established medication management therapy (MTM) programs in 2006 to be administered by health care providers, including pharmacists, as a part of the federal health insurance prescription drug program Medicare Part D. The program aims to address medication utilization issues commonly experienced by older adults, while also ensuring the best therapeutic outcomes and reducing costs. "Unfortunately, enrollment has fallen below CMS targets mainly due to issues in the program's design," Wang said. "Based on our previous analysis of policy scenarios, the eligibility criteria for medication management therapy programs may be too restrictive for racial/ethnic minorities because MTM eligibility is predominantly based on utilization of medications and health services, which minorities tend to use less. Further, we found that MTM eligibility criteria may perpetuate racial/ethnic disparities in health outcomes." A critical barrier to effective medication management therapy reform is the lack of stronger information about the actual effects of MTM programs on minorities' outcomes, utilization of MTM programs by minorities, and the cost-effectiveness of MTM programs. 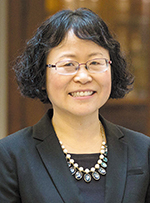 Using newly-released Medicare Parts A/B/D data, Dr. Wang and her co-investigators aim to provide stronger information to guide medication management therapy policymaking by the Centers for Medicare and Medicaid Services.